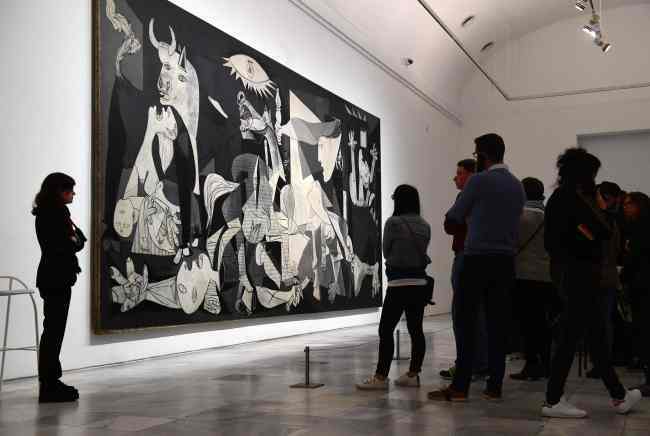 MADRID (AFP) - Close to 80 years ago, Picasso painted “Guernica” in a Paris attic, a haunting work of art that has become a universal howl against the ravages of war, from 1937 Spain to 2017 Syria. The canvas mixes stark images of agonizing humans and animals to depict the horror of the bombing of the small Basque town of Guernica on April 26, 1937 during Spain‘s civil war. Luis Ortiz Alfau, a 100-year-old Spaniard, was there that day “to pick up the dead and the injured,” he told Agence France-Presse. “Around 4 pm, three planes started arriving every 15 minutes, they were German and Italian planes,” said the former soldier on the Republican side. To mark the 80th anniversary of one of the most famous paintings in the world, studied by generations of schoolchildren, Madrid’s Reina Sofia Museum, where it now hangs, was set to hold a major exhibition from Tuesday. “Guernica‘s importance in the collective unconscious is such that I define it as a spiritual work of art, with a constant vocation of promoting peace,” Bernard Ruiz-Picasso, the Spanish artist’s grandson, told AFP. At the United Nations last year, French Ambassador Francois Delattre compared the destruction in the Syrian city of Aleppo to Guernica. “Aleppo is to Syria what Guernica was to the Spanish war, a human tragedy, a black hole destroying all we believe in,” he said. The Spanish Civil War kicked off nine months before the attack on Guernica when army generals staged a coup against a fledgling left-wing republic. Led by Gen. Francisco Franco, the nationalist camp had the support of Nazi Germany and fascist Italy. The attack, which is estimated to have left 150 to 300 dead, was the Nazis‘ first attempt at terror bombing civilians -- a tactic they would go on to use in World War II. On a large canvas more than 7 meters wide, he painted deformed figures of women and children writhing in a burning city. A broken sword in hand, a dismembered fighter lies with wide open eyes, an impassive bull, a wounded dove and an agonizing horse nearby. “It seems the faces are screaming out,” said Takahiro Yoshino, a 20-year-old Japanese tourist contemplating the painting for the first time in the Reina Sofia, which saw 3.6 million visitors last year. Nearby, Sonia Seco Cacaso had taken her kindergarten class to see Guernica. “When there is a problem, you have to resolve it and not through war,” she told them. Black, white and gray, the oil painting was Picasso’s response to a commission by Spain’s embattled republic for the upcoming World Exhibition in Paris. When it opened on May 25, 1937, Hitler’s Germany and Stalin’s Soviet Union competed with gigantic pavilions. Inside Spain’s more modest pavilion, Guernica loomed large and was greeted with mixed reviews. In his memoirs, Jorge Semprun, a Spanish writer who later served as culture minister, remembered that British art critic Anthony Blunt disapproved. “Picasso belongs to the past,” he was quoted as having said. French poet Michel Leiris, though, wrote that the painting was Picasso‘s “letter of mourning: all we love will die,” just as World War II loomed, as did the defeat of the Republicans in Spain’s civil war. In 1939, Franco took power for a 36-year-long dictatorship. Years later, he maintained that “the poor Marxists” set fire to Guernica. The canvas itself started a “life of exile,” said Peiro. From 1937, it was exhibited in Europe and the US to raise money for Spanish refugees. Then in 1939, Picasso entrusted his masterpiece to New York‘s Museum of Modern Art, where it stayed more than 40 years. Finally in 1981, the painting arrived in Spain, which was transitioning to democracy after the death of Franco. It was first put up for show in an annex of the Prado Museum, behindexplosion- and bulletproof glass to protect it from possible harm in a country still struggling to deal with its very recent, dark past, wrote Semprun. Now at the Reina Sofia, it has become the star attraction. It is a canvas that is particularly poignant “in the strange and worrying political situation we are going through,” he added.